The PlayStation.Blog ran a story covering two separate announcements concerning the work of Fumito Ueda and Team Ico. 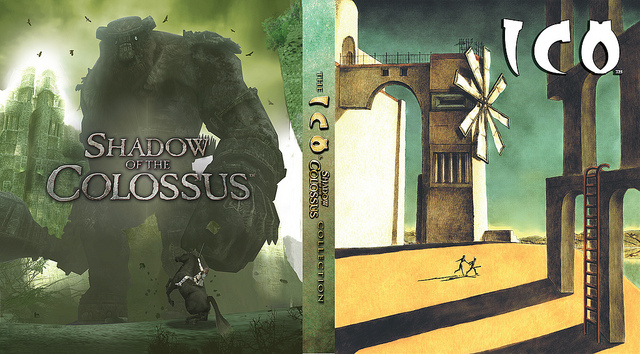 First, they officially unveiled the cover and gorgeous inside art (pictured above) for the ICO & Shadow of the Colossus Collection due out on the PlayStation 3 for the 27th of this month (September). They also brought with them some unfortunate news: Team Ico‘s next game, The Last Guardian, will not be making an appearance at the Tokyo Game Show next week. The game still hasn’t been shown off at a major gaming convention, and it even missed the show floor and behind-closed-doors opportunities at E3 last June. Brian Dunn, Associate Product Marketing Manager for Sony and author of the news, did want to ensure fans that The Last Guardian is still a property in motion. The Last Guardian is not on the schedule for this year’s Tokyo Game Show. However we can assure you that Ueda-san and the rest of the development team are hard at work to bring his lofty vision to life and deliver the very best gaming experience possible. The last we heard of The Last Guardian from Ueda himself came when he spoke in order to delay the property beyond 2011. The initial release schedule of holiday this year was too soon for the product. Ueda apologized then, but insisted that the quality of the title was what was most important to the team. “…to provide more challenging and better quality of content to users and to fulfill First Party Studio’s obligations, I decided to postpone its release timing. If it’s any bit the masterpiece that both ICO and Shadow of the Colossus are when it’s finished, The Last Guardian can take all of the development time from Team Ico that it needs, as far as I’m concerned.